Sales of mobile personal computers in the U.S. schools grew by just 3.5 percent over the past year, as the overall penetration of devices into districts is approaching a point of “maturity,” a new analysis finds. By the end of 2017, penetration of mobile PCs into U.S. schools will have reached over 50 percent, and many sales will be of replacement devices, according to a report by Futuresource Consulting. For all of 2017, total U.S. sales growth is expected to be 9 percent, down from 19 percent last year. 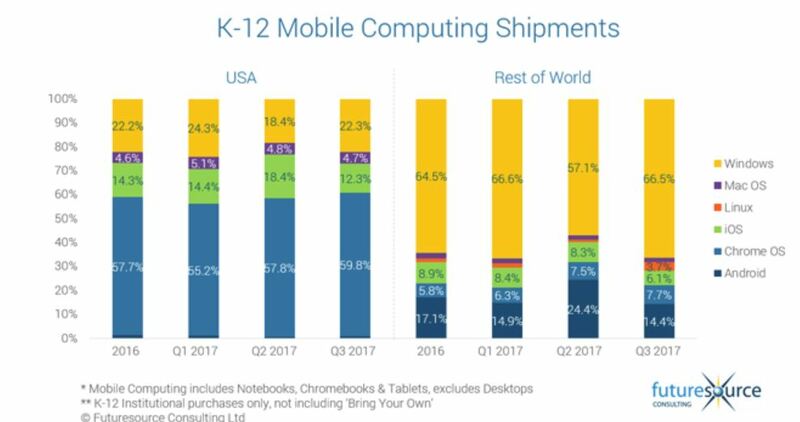 Chromebooks—devices that run on Google operating systems—remain by far the dominant leader in adoption in the U.S. K-12 system, with 59.8 percent of market share in the third quarter of 2017, up from 57.8 in the second quarter. While Google remains atop the U.S. throne by a wide margin, its growth shows some signs of cooling a bit, according to Futuresource, a U.K.-based company that studies the market in a variety of sectors, including ed tech. Mike Fisher, the associate director of Futuresource Consulting, saw several possible factors behind Google’s slower growth in the U.S. education market. One is that Apple launched a lower-cost iPad earlier this year. And Microsoft has made “huge strides in developing its education ecosystem,” recently introducing new devices and platforms, he said in a statement. In addition, Fisher said that during the third quarter, Futuresource Consulting for the first time saw evidence of original equipment manufacturers and “major channel players” reporting faster growth on Microsoft Windows-based devices than on Chrome-based devices. Even so, given that many of the future sales in the U.S. will be replacement devices, it remains to be seen whether school customers with Chromebooks could be convinced to change to Windows or another product going forward, Fisher added. While Google rules the mobile device market in U.S. schools, the international picture is very different. Windows operating systems captured 66.5 percent of the international mobile P.C. market for K-12 in the third quarter, making Microsoft the clear leader, as it has been for years. As measured by the use of operating systems, Android ranked second to Microsoft in international markets, with 14.4 percent of the share, and Chrome operating systems took 7.7 percent. EdWeek Market Brief recently hosted a webinar on how companies can conquer some of the biggest challenges they face in breaking into foreign school markets. Guests included William Toerpe, a senior international trade specialist with the U.S. Department of Commerce’s U.S. & foreign commercial service, whose office advises education companies trying to work abroad. Sign up here to listen to the conversation. Overall, while the year-over-over growth of mobile PCs in the U.S. market was 3.5 percent, it was much hotter internationally, at 26 percent. Microsoft’s dominance outside the U.S. can be explained in part by its especially strong presence in developing markets such as the Asian-Pacific region, Eastern Europe, and Latin America, Futuresource Consulting’s Ben Davis, the senior analyst for education technology, explained in an e-mail. In many of those global markets, big purchases are made at the regional or national level and are often driven by government policy. Chromebooks and Apple devices for education are not as strong in some international markets because of connectivity and price issues, Davis added. Additionally, the popularity of Intel’s low-cost Classmate personal computers has been a factor in driving the adoption of Windows-based devices in international markets, he said. Futuresource Consulting’s research on mobile PCs is based on interviews with players across the supply chain, Davis said. Those include providers of operating systems, original equipment manufacturers, and local resellers. Earlier this year, EdWeek Market Brief looked in-depth at the push by Apple, Google, and Microsoft to win over buyers in the school market. Our story included a nationally representative survey of educators’ views of those companies, as well as of Amazon, which has sought to put its stamp on school purchasing and cloud-based storage.